The best of all worlds — for climbing, speed and superior shifting. 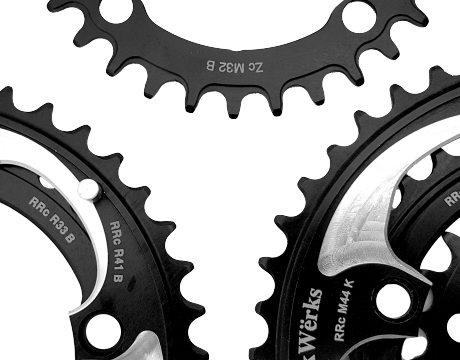 Available here for most popular cranksets. Add WickWërks to your Facebook and look for coupon codes! Better Shifting and Better Performance Than Any Other. 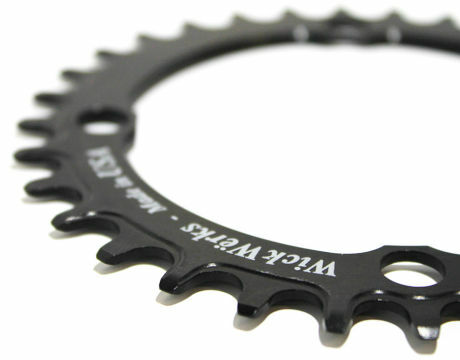 It’s Time to Re-Think Your Chainrings. Hugely impressive shift quality. Happened across this whilst investigating possible issues arising from the use of a 53/34 combination. I need the 34 ring due to the combination of my size and the terrain I am currently riding but my 2005 Modane braze-on doesn’t work too well with a 50 throwing the chain far too easily. Took a punt on these as most forums seemed to suggest that a 16 tooth differential was the maximum realistic option using ‘normal’ rings. The shift speed and quality – even with the 19 tooth differential – is absolutely superb. My name is Dmitry and I run Triton Bikes in Moscow, Russia. We participated at NAHBS show in SLC in March and our friends from TRP gave us your chain catcher for display. I have your catcher on my road bike. I was racing last Sunday and the road was a total mess, lots of riders had their chains drop. I was good. A couple of potential customers were interested in your catcher. I resumed racing cyclocross after laying off for two years. The first two races were marked by multiple chain drops. I read about the Sentinel and ordered it immediately. I raced with it yesterday and did not have a single chain drop. Sweet!!! Thanks for a wonderful product. Fantastic rings. My double 34/44 Katie Compton specials shift better than the Shimano rings they replaced. I’m looking forward to racing nor cal CX on these later this year! 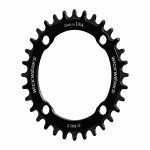 Recently I purchased the WickWerks Cycling components Chain rings and could not be happier. The customer service provided by Chris is second to none and made the whole process as smooth as possible. 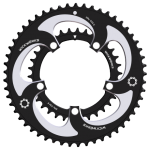 The Chain rings were being fitted to a Quark power meter, Chris was able to walk me through the fit, making it easy to attach the product first time, and they’ve worked perfectly since. Great product and great service make me more than happy to recommend this product to everyone willing to try it. 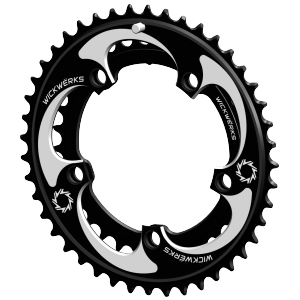 Founded and developed by cyclists, WickWërks offers advanced component solutions for an improved riding experience. By refining existing technologies and innovating new ones, our products provide a competitive advantage to racers, and a more enjoyable ride to recreational cyclists. We are proud to offer choices that makes a noticeable difference. 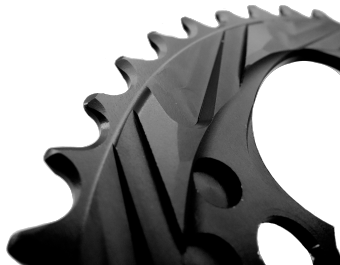 With Chainrings, the details make all the difference. These are the “Radical Ramps” of our BRIDGE Shift Technology. 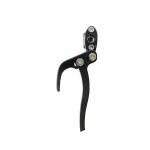 Unlike the shifting pins seen on most chainrings, these ramps are like big hands reaching out to grab a whole fist full of chain to SHIFT — when you command it. So, when we say “Shift Your Expectations”, it’s more than just a play on words. The advancement of technology is often step by step — starting in one place and ending up in another. 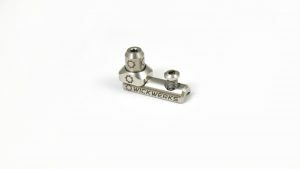 WickWerks is full of innovative products that came about as enhancements of or enhancements to other, sometimes older, technology. 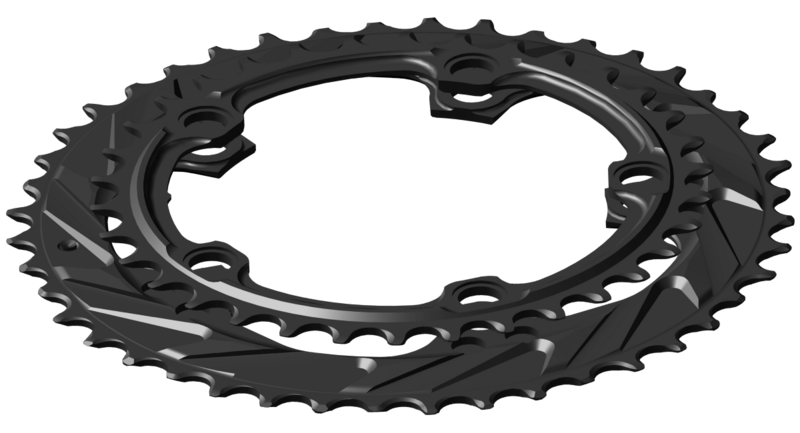 Our latest 1X technology is just that — Z-Rings are Narrow-Wide Enhanced.